My only problem with this is that read should have larger nose, but good job! 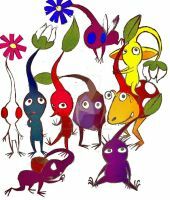 Red and yellow pikmin don't have mouths.... XP I'm just teasing ya, i like it! J adore les Pikmiiiiins!!! Quand j y joue je suis toujours le général Olimar! Aw, ils sont tous trop choupinou !!! Ca donne envi de les ecraser hein ? This is wonderful! I really like the colouring and the way you have shown all their personal traits! mais j'adore vraiment les expressions qu'ont les 3 que tu a fais. Olimar c'est un putain de capitaliste de l'espace. Et ouaip, sont choupis ces pique mines !